The national flag of Aruba was first raised in March 1976 and is since then one of the main symbols of the country such as the coat of arms and anthem. Rectangular flag Aruban flag has a classic proportion of aspect ratio - 2: 3. It can lift as individuals and state bodies and public organizations of the country. 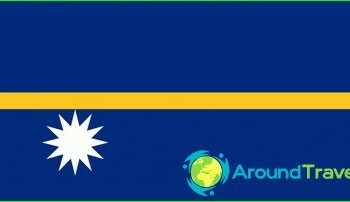 The main field of Aruba flag is made of bright bluecolor. According to the authors of the flag it symbolizes not only the waters of the Caribbean Sea, but also the freedom and independence, the hope for a better future and a peaceful disposition of the people of Aruba. At the bottom are two horizontal flagthin yellow stripes, meaning the wealth of the country, its natural resources and tourism, which provides basic income Aruban economy. Gold stripes on the flag of Aruba - a symbol of sunny weather, which pampers its warmth and guests and locals. At the top of the flag of Aruba close to the shaftis applied to a four-image of red stars with white borders. Its symbolism is treated differently. Four beam - these are the main languages ​​spoken by the locals. The red color of the symbol recalls the blood spilled by the heroes of the country in the war of liberation, and the white border symbolizes purity of thought and unsophisticated islanders. The red star with a white fringing on a blue background - it is also self Aruba surrounded by its white beaches, drifting on the waves of the blue Caribbean Sea. The colors of the flag of Aruba also present on the emblem of the country,officially approved in Independence Day. It is a heraldic shield divided white cross on four fields. Their background colors - red, yellow and blue. The shield shows the symbols of the state, which are important for every islander. Aruba Island as part of the Leeward Islands wasIt opened at the beginning of the XVI century by the Spanish. A century later, the island was captured by the Dutch, and gradually turned into an agricultural appendage of the Netherlands. During the colonial state flag Aruba flag served as the Netherlands, and only in 1976 the islanders gained independence and its own flag. Aruban Flag extremely revered in the country. March 18 is celebrated annually on Flag Day, which is widely celebrated in Aruba. Locals organize Carnival and Fair in honor of the national flag, which are attended by numerous tourists. 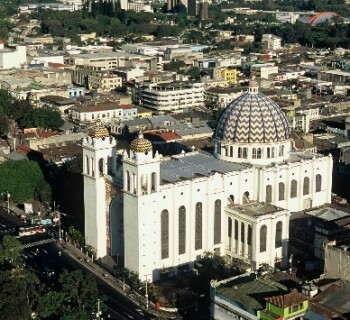 The capital of El Salvador: map, photo. What is the capital of El Salvador?